So it turns out I have a new hobby. A new way to kill time. Yet another way to connect with colleagues, friends and co-workers. I PUSH the little plus sign when I visit their Linkedin profile. That’s right… I ENDORSE my contacts. And truthfully, it IS that easy. 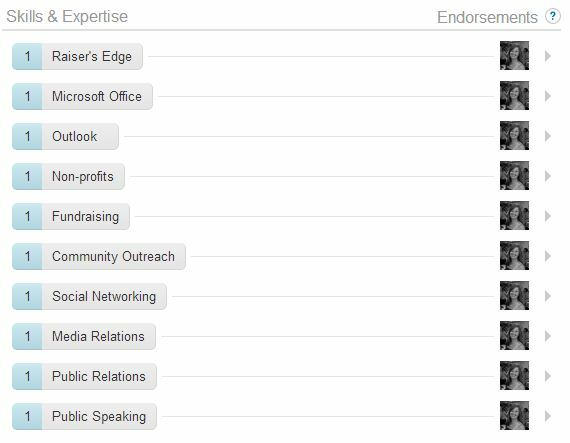 Different from Linkedin’s ‘Recommendation‘ feature, an Endorsement allows those who know you best to ‘Endorse’ your areas of expertise. Endorsements are a new idea, but I really like them. 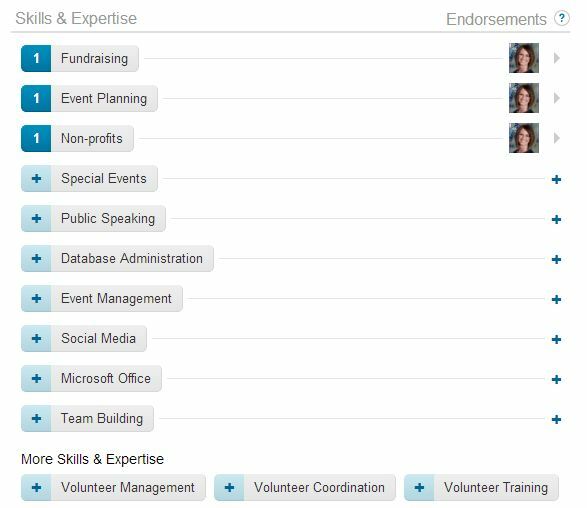 For someone looking for a new job, the endorsements feature allows employers to browse the individual’s skills and see which areas have been endorsed by others. For this reason I take my endorsing very seriously. While I know that my cousin is a teacher, I won’t endorse him as a teacher because I haven’t worked with him in this role. But I’ve seen his stand up comedy acts at family parties, so I might endorse him as a stand-up comedian. I know that my friend from church works in sales, but I’ve only worked with her on volunteer matters that are church-related. So I wouldn’t feel comfortable endorsing her work in sales, but I’d be more than happy to endorse her as a volunteer. A former co-worker has changed careers, so I would feel comfortable endorsing those skills that she shared when we worked together, but I can’t speak for what she does now as the work we do no longer shares a common interest. You get the idea. To start endorsing simply log in to Linkedin and visit a colleague’s profile. Across the top of the page you’ll get a pop up box asking if your colleague has the following skills or expertise. Note that this is just a sampling of skills, not necessarily all of the skills your colleague has listed. What I love about this is the flexibility you have in endorsing. 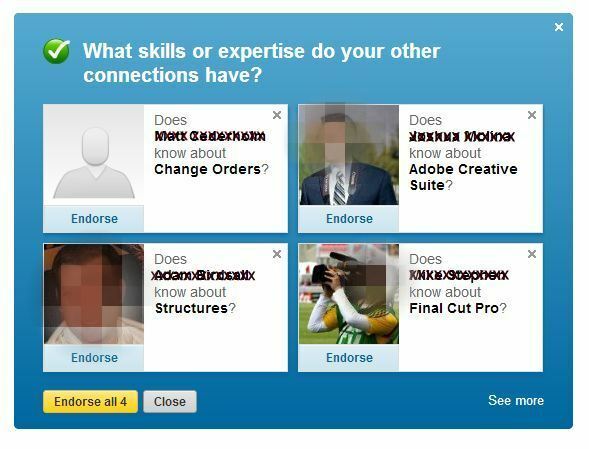 In my friend Steve’s case, if I don’t feel comfortable endorsing him in ‘Sales Management’ I can simply click the ‘x’ and close that skill, then go ahead and click the ‘Endorse’ button, and endorse the other four skills all with one click of the mouse. If I want to add to the list I can click in the box where it says ‘Type another area of expertise…’ and add another skill that I want to endorse. This is a great feature because Steve may have overlooked a skill that I really feel should be added to his profile. If you prefer to endorse skills one at a time you can just scroll down your friend’s page and look for the list of skills. Simply arrow over to the right side of the page and click the + sign for each skill you’d like to endorse. 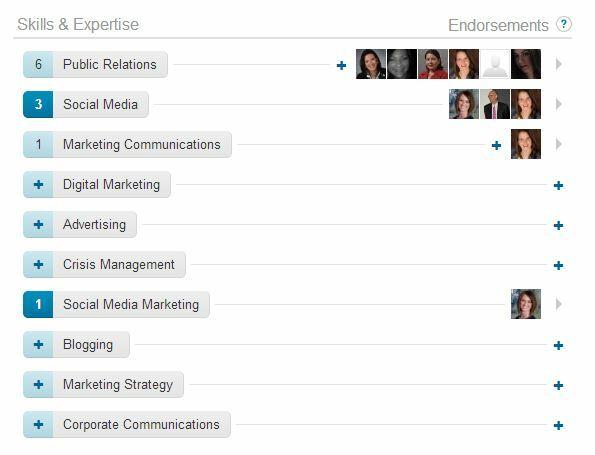 If you do chose to endorse a friend by clicking multiple skills at a time, once you complete your endorsement your screen will update to a grouping of four different colleagues. This is where you can really start to have fun. It’s a lot like playing a card game. You go through and click ‘Endorse’ on the ones you feel comfortable endorsing, and once you do the card will update to a new contact. Better yet, click ‘Endorse all 4’ and then get four new faces all at once. Go ahead. Give it a try. I DARE you to tell me it’s not addicting! As popularity of the Endorse feature grows your colleagues will soon catch on. The hope is that not only will they benefit from being endorsed by you, but that you’ll soon benefit from all of those who return the favor. So go ahead and visit your Linkedin account and start endorsing. Leave a comment and let me know how it goes.